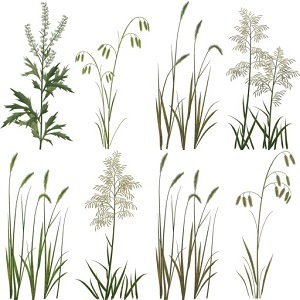 Grass is rendered as a set of 2D textures (blades), each of which represent a small grass tuft. Grass diversity is achieved by the probabilistic factor that influences the grass blades height, offset, color, etc., which grants convincing illusion of natural variation with fine details, while not monopolizing the GPU. The grass can be animated, which makes it realistically sway in the wind. On the Menu bar, click Create -> Object -> Grass. Place the object somewhere in the world. The default grass field would appear with the grass_base material assigned. A diffuse texture defines the grass shape and color. 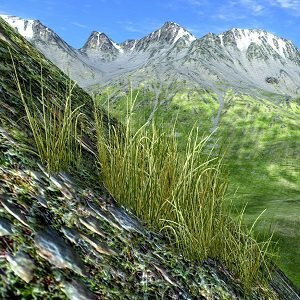 A mask texture determines grass mapping and density distribution on the terrain. The horizontal row can have up to 4 chunks. Each chunk would correspond to the red, green, blue and alpha channels of the mask. The vertical column can have any amount of chunks. The chunks in the column represent the variations of the grass per the mask channel. Usually, each channel corresponds to the particular species of grass (thiner, thicker, tangled, etc.). If there are several grass clusters in a vertical column, they will be randomly spread across the masked area. For the texture to be split on the correct number of chunks, the number of chunks that you've used should be specified in the Num textures field. For example, for the diffuse texture below, Num textures = 4 should be specified. 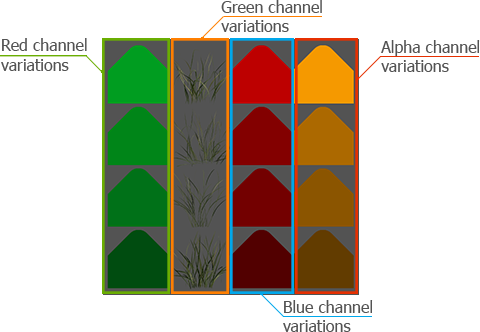 The RGB values store grass color information. 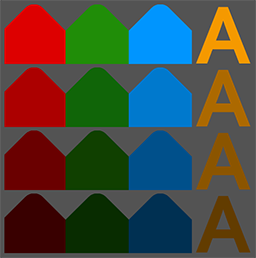 The A value stores transparency information and defines which parts of the grass chunks will be rendered colored and which ones will be cut by means of the alpha test. 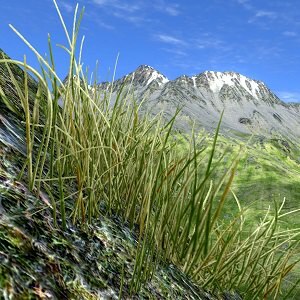 Set in the Textures tab of the grass_base material. Mask RGBA8: each channel controls the distribution of the chunks in the vertical column of the grass diffuse texture. Red channel specifies the areas of growth for the 1st texture column. Green — for the 2nd texture column. Blue — for the 3rd texture column. Alpha — for the 4th texture column. 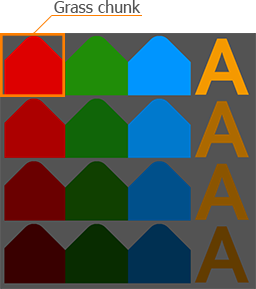 In case R8, RG8 or RGB8 texture is used as a mask, only the first, the first two or the first three columns of diffuse texture will be displayed. So, if your diffuse texture contains, for example, only 1 vertical column, the R8 texture will be enough. 0 mask channel values (no color) create areas where the grass should not grow. Non-zero channel values create a grassy area: the higher the value, the denser the grass grows. If the mask texture is not set, the default white texture is used. It doesn't have the set amount of channel: the type of this texture depends on the value set Num textures field. So, if Num textures = 2, the default mask texture will be RG8. Set in the ObjectGrass -> Grass tab - > Mask Image field. We see, that in the first column, chunks of the green shades correspond to the red channel of the mask, which is 9 red rhombuses; in the second column, chunks of the real grass variation correspond to the green channel of the mask, which is the square green mask frame; in the third column, chunks of the red shades correspond to the blue channel of the mask, which is the blue rhombuses frames; and in the fourth column, chunks of the yellow shades correspond to the alpha channel of the mask, which is the rest black areas (note that these parts won't re rendered, as there no alpha color data). Mean value (set in the main field of the parameter:Aspect, Minimum/Maximum Height, Offset) defines the average value of the distribution. Four fields correspond to the red, green, blue and alpha channels of the diffuse texture correspondingly. With its help the designer can set setting milestones to control the parameter. Spread value defines the range for possible variation of the parameter. Four fields correspond to the red, green, blue and alpha channels of the diffuse texture correspondingly. The higher the value, the more diverse the final result will be. Spread value is optional: if set to 0, it will not influence the simulation process and only the mean value will be uniformly used. The probability of appearance of the grass chunk belonging to the definite mask channel (horizontal row) depends on the Probability parameter. The variations of the specie (vertical column) will be rendered randomly. As a mask the default RGBA8 white texture will be used (as there are 4 chucks in the diffuse texture, we would set Num textures to 4). As its value is white = 1, the whole grass area will be filled. Both the minimum and maximum height are mean values and set for each of the diffuse texture columns separately. The minimum height mean (Min height) value is set to 1.2 and the minimum height spread (Spread) value is set to 1. The maximum height mean (Max height) value is set to 3 and the maximum height spread Spread) value is set to 1. 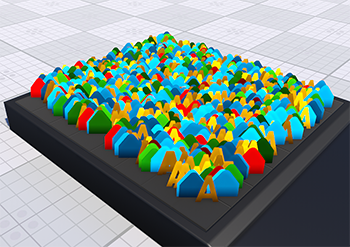 As a result, some grass quads on the field will be 3 units tall, some 2 and some 4 in the random order in areas with high density , but not less than 0.2 in areas with low density. To render the intended grass quad, besides the height, it should also have the width set. But in order to preserve the proportions more easily, the latter is not specified directly, but rather using the aspect parameter. So the final width is calculated by multiplying the Max height by the Aspect. If mean value is set to 1, the grass will be rendered in square proportions, with height equal width. If mean value is set to 2, the width of the grass quad will be twice longer than its height. Sometimes to avoid visual artifacts, it is necessary to slightly raise the grass quads above the ground. This parameter specifies the offset in units up the surface normal, thus accurately repeating its relief. It is set by mean value (only positive) and additional spread value (positive or negative), if variation is required. If an image mask is used to specify the grass density distribution, the number of diffuse texture columnscan be less than 4. 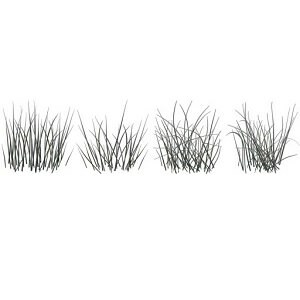 If a mesh mask is used to specify the grass distribution, the number of diffuse texture columnsmust be equal to 4. If both masks are used (the image mask sets the grass density distribution and the mesh mask is used to exclude some areas such as roads and so, the number of diffuse texture columns also must be equal to 4. 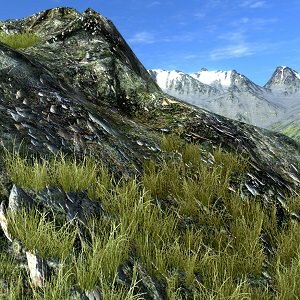 Num textures parameter sets how many horizontal rows with grass clusters, plants or flowers are presented in the diffuse texture. 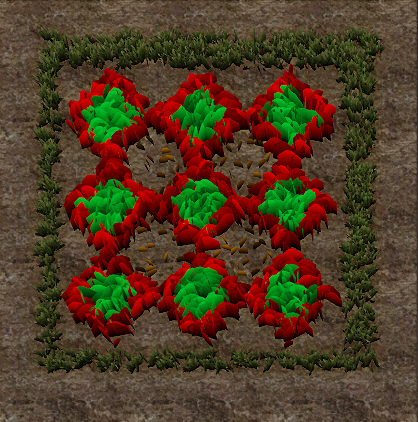 After specifying the number, each grass cluster is rendered as a separate quad on the field. 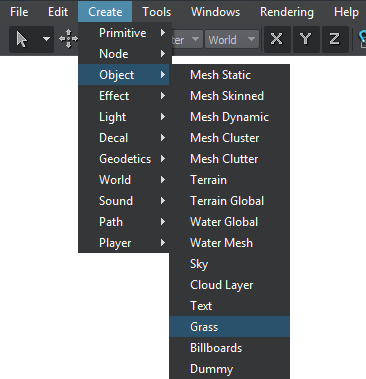 To present additional diversity to the grass and avoid total uniformity of all the blades in the field (especially needed if it is represented as billboards), variation option can be enabled. On the randomly chosen quads, it flips the texture horizontally, automatically giving two variants available for rendering of varied blades. 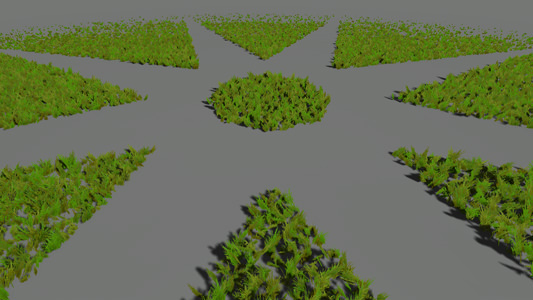 2 possible variations for grass (automatic horizontal flipping). Orientation. Grass quads can be oriented both along its own normal vector and along the normal vector of its parent node (usually - a terrain). 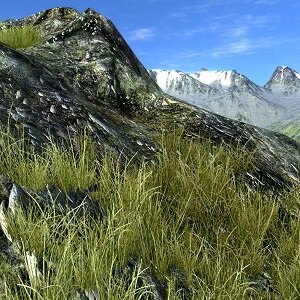 However, on steep hills the grass oriented along the terrain normal can look unnatural (as the grass growth direction is up), so you will need to choose an appropriate value for the Angle parameter. Angle. This parameter affects to grass distribution that varies depending on the ground slope angle. This parameter simulates the natural tendency of the grass to strike root in more flat places. 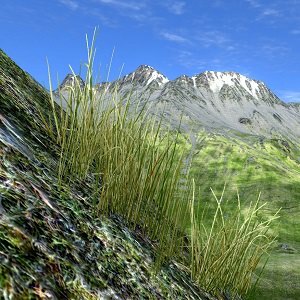 Make the grass a child of the terrain or any arbitrary mesh (static or dynamic one). If there are some nodes in the hierarchy between a terrain or mesh node and grass, intersections will still be checked. 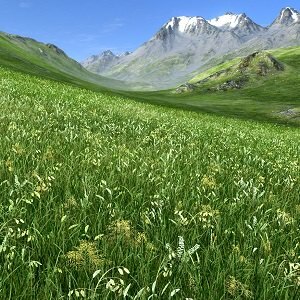 The grass can shoot as a few separate blades, or form a field of green verdure receding into horizon. The size of the field determines the extent of rectangular area, which will be covered with grass. Size X specifies the length of the grass area along the X axis. Size Y specifies the length of the grass area along the Y axis. Visually attractive grass, however, may reduce performance if its is rendered as whole. To allow rendering at interactive frame rates, the field is split into cells that form a grid. Each cell is estimated, whether it contributes to the grass field or stays grassless. The grassless cells are disregarded, while for the cells with grass all the required computations are done. Depending on the density, the blades are planted in the cell with random coordinates, imitating the natural vegetation sprouting. The cells are rendered one by one, starting from the camera and further forward. To get the resulting number of cells, Size of the field (both alongX andY axes) issplit by the Step. Each cell requires 1 DIP call, so the higher the number of cells (i.e. the smaller the step), the more reduced the performance is. However, to create one large grass cell takes longer time. When the camera moves fast enough, small cells will be created one-by-one very fast and smoothly, but large ones can noticeably pop into sight and cause a small rendering lag. Usually the Step value is set between 10 to 25 (for the normal grass; if the grass is used as a distant LOD of World Clutter or Mesh Clutter, the Step may be different, see details below). Controlling the step for dividing field into cells allows you to change the field size, while not influencing the set density for planting the grass blades. On the other hand, that is why if we change the step and consequently the number of cells, while not altering the density value, the number of grass quads rendered will be different. Step = Maximum Visibility Distance / k, where k ∈ [3..4]. If the Step value is too small and the maximum visibility distance is large, cells will be rendered too long. Also the number of DIP calls will increase significantly. On the other hand, if the Step value is too large, there will be performance spikes due to the increased number of objects per cell. So the coefficient in range from 3 to 4 presented in the formula above will help to find the right balance. Each cell can also be subdivided into smaller parts by specifying a value of the Subdivision parameter. This is usually required when the grass is used as a low-poly distant LOD of a forest created by using World Clutter: the Subdivision parameter subdivides big grass cells so that they match the smaller clutter ones. 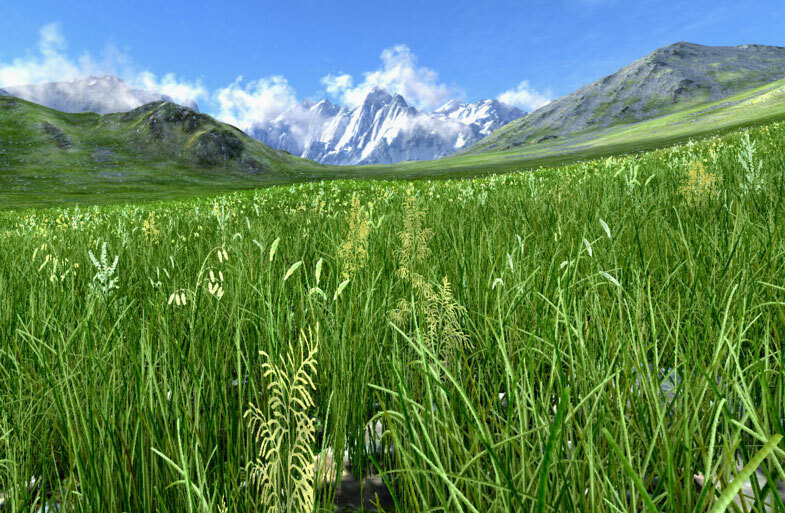 To simulate the convincingly looking pasture that naturally blends with the rest of the virtual environment, the grass field can take an arbitrary outline gradually shaping and growing on the ground. 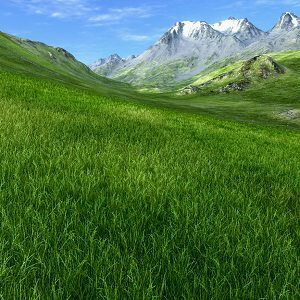 Furthermore, the grass can grow chaotically and irregularly forming clumps of green and grassless patches, just like in the nature. 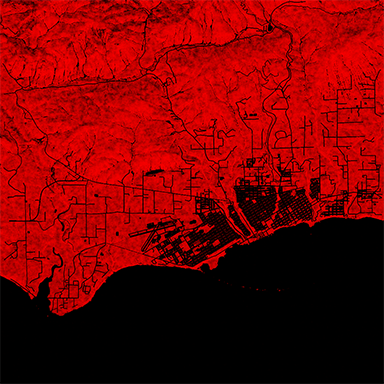 Making this effect possible, the mask is mapped on the terrain and determines the density distribution that will meet the requirement of the created landscape. The mask is an RGBA8 texture. Each channel of it controls the distribution of the grass per vertical column of grass diffuse texture (there can be up to 4 columns in the diffuse texture). Red channel specifies the areas of growth for the 1st texture column. If there are several grass clusters in a vertical column, they will be randomly spread across the masked area. Blue - for the 3rd texture column. Alpha - for the 4th texture column. For every channel separately, areas where the grass should not grow have 0 channel value (no color or alpha data). Non-zero channel value creates a grassy area: the higher the value, the denser the grass grows. Threshold that controls starting from what density (according to the mask), the grass should grow. Min value and Max value that set the color density range. Flip X and Flip Y that flips the texture horizontally and vertically (respectively). To paint the image mask directly in the scene, use Mask Editor. As a solution for advanced objects seeding and memory consumption optimization not only a whole mask, but any required part of it can be applied to the object. It means that different multiple objects can share the same mask, but use different levels. By default, each channel of the image mask specifies the areas and the density of growth in the [0;255] color density range. However, by using Min value and Max value, you can specify any color density range in this diapason and that part of the mask, which contains the specified density range, will be used to seed the grass. In range from 100 to 200 density of the short grass can be stored. The part of the image mask, in which the specified range of color gradation is stored, will be applied for the short grass object. In range from 160 to 230 density of the grass of the mean height can be stored. In range from 190 to 255 density of the tall grass can be stored. Vector masking allows creating roads, rivers and so on with extremely high precision as it is independent of the mask texture resolution. A mesh-based mask can be set for grass to specify areas where grass should or should not grow. A mesh for masking should be a simple planar mesh. 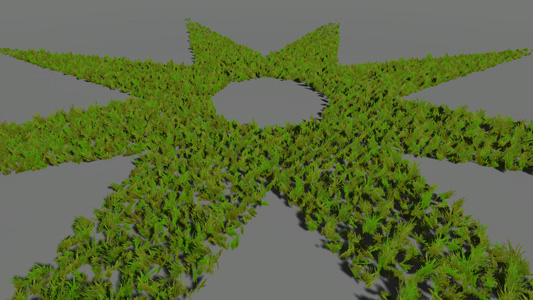 When using a mesh mask to specify the grass distribution, the number of diffuse texture columns must be equal to 4. Otherwise, the diffuse texture will be applied incorrectly. 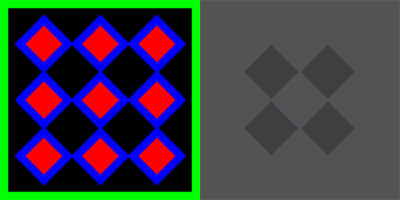 A mesh mask can be inverted by toggling the Inverse flag. 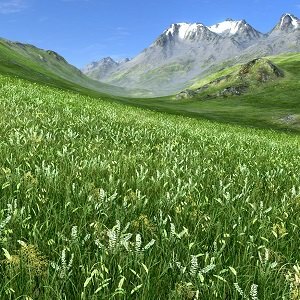 Any area of a grass field can be animated by using Fields. Fields can also be used to specify areas of grass that should not be rendered. Such areas of grass are specified by the Field mask in the Grass tab of the Parameters window. The field mask set for the grass object must match the field mask of a Field node applied to the grass. 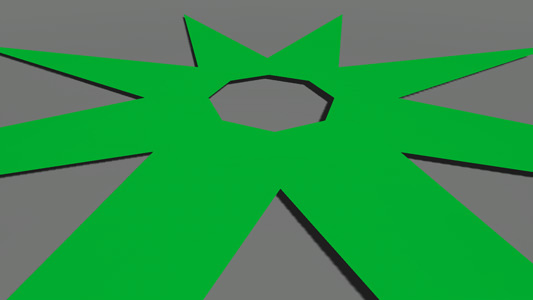 See the example on animating grass with the animation field here. To achieve the sufficient richness of a grass field, Density parameter can be tweaked. 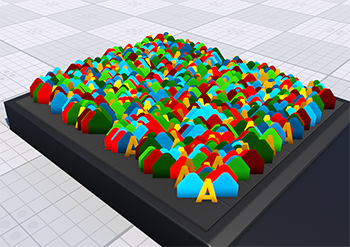 It determines how many grass quads are to be rendered per square unit. The higher the value, the more grass blades quads are presented and the more closely they are positioned. But it should be kept in mind, that the final result also depends on the Step of division and the number of cells it defines. To randomly position grass blades quads across an area by an image mask, set up the Seed value, which is actually an integer value used to generate pseudo-random successions of numbers (in other words, arandom seed). To get a random seed value, press the Randomize button. The same Seed value will always generate the same successions of numbers. Setting up the Seed value is necessary when there are more than one grass object in the world. It enables to position grass quads differently so that 2 quads don't have the same coordinates. To achieve the predominance of one type of the grass over the other types, you can use the Probability parameter. 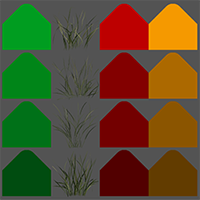 This parameter sets the grass rendering probability per diffuse texture column: you can specify a probability factor for each column of the diffuse texture separately. For example, if you set the probability factor to 5 for the 1st column of the diffuse texture, the grass blades quads stored in slots of this column will appear more often. As it was mentioned above, rendering all grass cells at once (and therefore thousands of grass polygons) drastically drops performance. 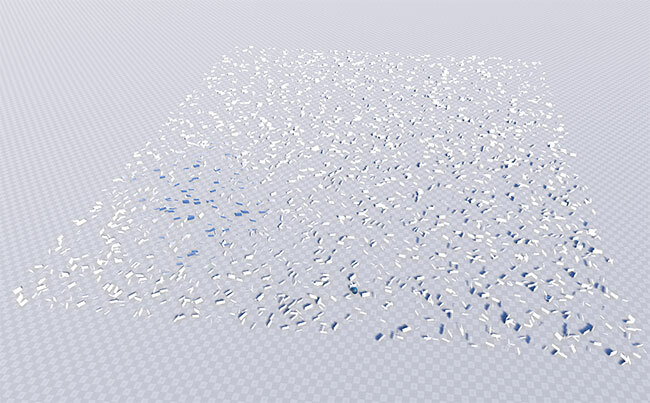 So, to reduce the number of polygons rendered each frame, it is necessary to set the Spawn rate that controls the number of cells rendered per frame. Thehigher the spawn rate, the more likely a performance spike will occur. 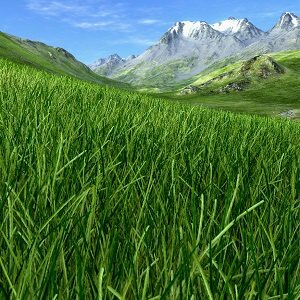 However, at a low spawn rate and FPS values the grass will be generated right in front of your eyes (creating an effect of grass quads popping) on the approach of the camera to the grass field. Except reducing the number of cells rendered per frame, the grass field can be thinned out with a distance: you can check the Thinning box in order not to render random grass polygons across the grass Fade distance. 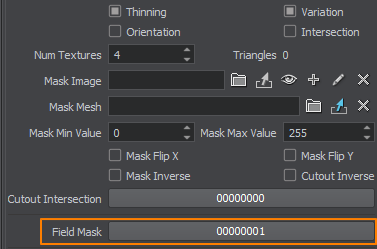 When changing the settings described above, you can compare the previous and the current number of grass triangles: simply check the Triangles counter. For the normal grass (that is used properly), the optimal step is in range [10..25]. For the grass that is used as a distant LOD (for a forest, for example), the optimal step should be calculated according to the formula. Seed of both objects so that they are positioned the same way. Size X, Size Y of both objects. Orientation flag is enabled/disabled for both objects. Intersection flag is enabled/disabled for both objects. Flip X, Flip Y are enabled/disabled for both objects (in case an image mask is used). Inverse is enabled/disabled for both objects (in case a mesh mask is used). Min value and Max value of both objects (in case an image mask is used). Angle, Threshold, Density, Probability of both objects.